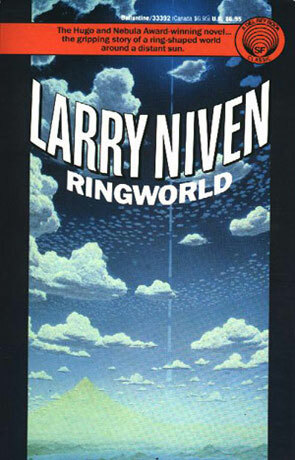 Ringworld is a science fiction novel by the award winning author Larry Niven. I'm sure that I have already read this book once a long time ago - probably about ten to twelve years ago, and that was probably in danish - anyway I had forgotten most of the important stuff and everything that would have spoiled the story for me. There was a feeling of familiarity about a lot of the scenes in the book - In a way it was like coming home to a long forgotten playground. Ringworld is hard SF* at its best - it's not so hard that it forgets the characters and it's hard enough that you (well, I) don't find the science too impossible. It's a lot about science but mostly it's about our four heroes. Louis Wo and Teela Brown are the two humans of our travelers party - but they are also very different, nearly as different as a human and one of the aliens that we encounter. Louis Wo is two hundred years old, and is getting bored with life. Teela Brown is twenty years old, and "infested" with good luck - she doesn't know what it feels like to be hurt and she nearly doesn't understand the concept of pain. Nessus is an alien of the race called the Puppeteers, a race that have evolved into a nonviolent and cowardly race, that never takes a risk - only Nessus is insane. The last of our party is the Kzin Speaker-to-animals (he is an ambassador to the humans - and goes by the name of his profession). He is from a race of very violent aliens, that have been at war with the humans for many centuries. The fantastic four gets to go to a ringworld that the puppeteers have found while fleeing the milky way (a ringworld is a band around a sun - made from all of the material from the original planets of the system and then given spin to induce a gravity effect on the inside - like a slice of a Dyson Sphere - read Indistinguishable from magic if you want to know more the technology behind this). The ringworld gives Larry Niven a lot of playground and a lot of space to let just about anything happen (the ringworld has the area of three million earths!). This is where I feel that Niven fails somewhat. The tech is interesting and the interaction between the humans and the aliens are very interesting, but nothing really happens that couldn't have happened on a normal planet - There is all this space and Niven goes to great length to try and convey the enormity of the ringworld to the reader, but in the end it really doesn't matter. This doesn't make Ringworld a bad book, the characters are interesting and they are the important thing in this book. I enjoyed reading it. *: This may collide with your definition of Hard SF - I find the question of what's real Hard SF uninteresting - so please don't bug me about it. Written on 1st May 1999 by TC.